2 bedroom apartment near Mayflower Beach (1 mile) and Dennis Village (.25 Mi.). The suite is newly renovated and tastefully decorated with refinished hardwood floors throughout with an open and airy feel. The kitchen is cozy and equipped with all the essentials you will need for making your morning coffee to cooking up your evening snacks/meal. The round kitchen table with 4 chairs is the perfect place to enjoy mealtime or card/board games. The living room is clean, bright white paneled walls, furnished with a comfy couch and cable TV. The lantern lamps on the end tables provide excellent lighting for late night reading of your favorite book or Cape Cod Life magazines we provide for you. The bedrooms are furnished with comfortable beds, bureaus, and closets with hangers for your personal belongings. Extra pillows and blankets are provided along with everything you need for a good nights sleep. The bathroom was just renovated with a new shower surround, tub, and fixtures. The pedestal sink and black and white tiled floor add for a unique cape cod feel. The bath is equipped with plenty of shelving for your toiletries. The private side yard is lined with a brand new fence landscaped with rose bushes. There is plenty of room for cookouts on the charcoal grill, and ping pong and other outside games (available upon request). An umbrella table with chairs is provided for dining. If you'd like to take a bike ride just let us know. We have 4 bikes we can lend you (helmets not provided). We have everything you need for a convenient, funfilled, comfortable vacation! This is a great north of historic Rte 6A location on the road to Mayflower Beach. 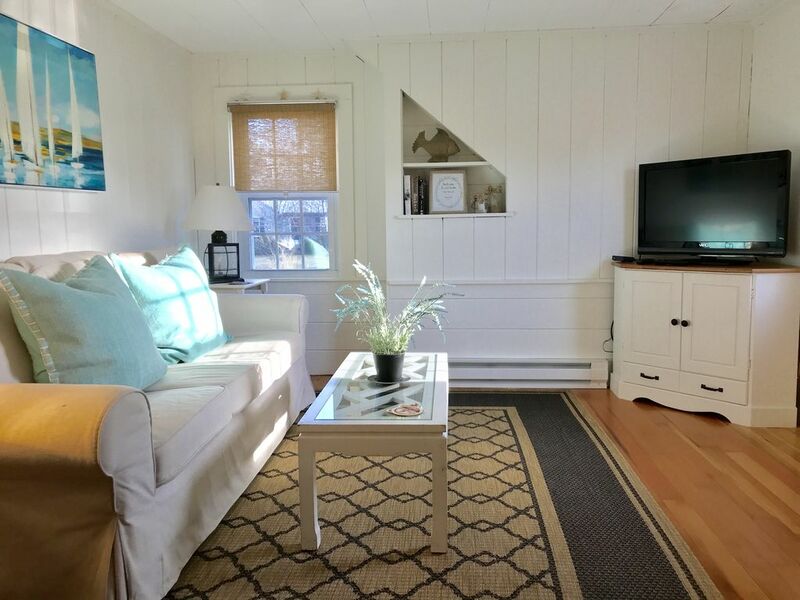 The property is at the Village end of Beach Street which allows for a short .25 mile walk to just about everything you need, as well as some of the best restaurants on the Cape. With Mayflower Beach just 1 mile away and Bayview, Chapin and Corporation just a ½ mile or so further this location is much sought-after. The bathroom was renovated in 2017. The property is located 1 mile from Mayflower and Bay View Beach on Cape Cod Bay. Chapin and Cooperation beaches are located 1.5 miles from the property. Walk to Dennis Village shopping, restaurants, bars, theater, cinema and art museum. Bath towels only are provided. Cute comfortable place to stay. Loved a lot about the vrbo. Would have liked a little soap & shampoo. It was a lot of stairs to haul up our luggage. Cute Cottage but no Hot Water! The cottage was well furnished and in a great location. I went to the Cape to spend Thanksgiving with some friends and it was extremely cold.I requested to go in a little earlier to heat up the cottage but was told that it would not be necessary as the heat was on low. When we finally came in that evening the temperature in the cottage was about 45 degrees. It took a while to heat the place up but once it was on it was comfortable. Unfortunately the next day there was no hot water at all. We were not able to wash dishes or take a shower. The owner was accommodating and let us access the main house to shower but it was uncomfortable. I was told that when we were out that someone would be stopping by to fix or check in on things with the frozen pipes. We returned and there was still no hot water or any update communication with the owner. It was obvious that the pipes had frozen but annoying that could have possibly been avoided if we were permitted to enter before check in time to heat up the place. Overall disappointing with the way things turned out but made the best of it. Unfortunately, because of the unforeseen severe coldspell for that time of year, our pipes froze up. This has never happened before and we felt helpless being so far away. I'm so sorry about that. We are usually at the property, but because of the holiday, we were away with family. That is why we contacted a relative to go over to see what he could do to help. I'm sorry if that made you feel uncomfortable. We thought we were doing the right thing allowing you access to our personal residence to take showers. That was not easy for us, but we knew we had a responsibility to accommodate you and your friends. Your request to check in 4 hours early would not have changed this situation, unfortunately. We try to adhere to our check in and out times within an hour to allow for thorough cleaning between guests. Our sincere apologies once again. You really cannot beat the location of this property. Only a mile to Mayflower Beach and close to everything around Dennis. The apartment could use some minor updates and improvements but it’s nicely decorated, clean, and cozy. And the owners were great at communicating with us. We would totally recommend and stay here again. Highly recommended -- we loved our stay here. Thanks! Das Cottage ist sehr sauber, gemütlich und top eingerichtet. Es fehlte an nichts! This is a great north of historic Rte 6A location on the road to Mayflower Beach.The property is at the Village end of Beach Street which allows for a short .25 mile walk to just about everything you need, as well as some of the best restaurants on the Cape. With Mayflower Beach just 1 mile away and Bayview, Chapin and Corporation just a ½ mile or so further this location is much sought-after. Here’s what you can find right in the Village. As one of the top scenic byways in the country, scenic Rte 6A hugs the inner coast of Cape Cod, winding its way through picturesque villages and breathtaking saltmarshes. The road is lined with dozens of local shops, making it a perfect destination for shopping. Hunt for antiques or pick up souvenirs and gifts. The Cape Northside beaches have cool clear water and great low tide flats which expands the beach area for recreation. The beaches are active at sunset and offer a rare east coast sunset over the ocean. Route 6A is a historically preserved road that connects Sandwich, Dennis, Barnstable, Yarmouthport to Brewster, Orleans and offers many shops and art galleries.